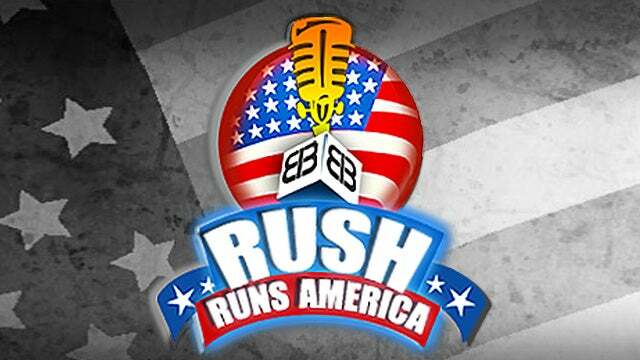 RUSH: I'm a guy in a golf shirt in Palm Beach -- Rush Limbaugh -- supposedly running the country's immigration policy. We go to the audio sound bites. This was Sunday morning on the local Fox 5 news station in Washington, D.C. This is not the Fox News Channel. This is WTTG Eyeball D.C. Fox 5. The anchor, Tom Fitzgerald, was speaking with Fox News Sunday host Chris Wallace about the possibility of another shutdown. Oh, by the way, I'm gonna be appearing on Fox News Sunday this coming Sunday. It airs live on the Fox broadcast network at 9 a.m. and it's run at all kinds of different times depending on your market, and then the Fox News Channel replays it at 2 p.m. and 7 p.m. on Sundays. They ask me every February to appear on the program and I routinely, graciously agree. So it's this Sunday. This is gonna be interesting because the host here of the local Fox station in D.C. asked Chris Wallace, "No matter what deal Congress comes up with, this really does all hinge on the president as to what he'll accept and then be able to declare victory on, correct?" WALLACE: We've seen this act before where the president back in December agreed to a bipartisan compromise just to keep funding the government into February. And then he took such heat from hardliners on the wall like Rush Limbaugh that he changed his mind and said, "Nope! Well, let's go have a shutdown." So, you know, you have to ask, "How much are the president's assurances worth, and will he sign a deal that he says -- he may say right now he's willing to sign?" RUSH: Okay. How many times do you people think...? How many times have you been bored now by me explaining to you what really happened on this? I don't know how many times I've explained it to you, but it's a bunch. I bet I'm gonna get this question on Sunday, despite explaining this I don't know how many times. The president was not getting ready to sign it. He did not have the D and the O of his name signed, and then an aide ran in (shouting), "Mr. President! Mr. President, stop! Stop! "Rush Limbaugh says no! Rush Limbaugh's ripping you!" And Trump stopped and didn't sign it. That's what they want you to believe happened? Okay. For about the fiftieth time, what happened was, I'm sitting here and I'm reading the news, and the news says that Trump is thinking of signing the continuing resolution that would keep the government running with absolutely no money for a wall, which was his signature campaign issue. So I am sitting here as I am now saying what I just said, and I get a flash instant message on my iPhone from somebody who says, "The president wants you to know he's not signing this. He doesn't have any intention of signing this. So don't believe what you're reading." So I said, "Ladies and gentlemen, I just got a message from someone close to the president saying that he's not gonna sign this and didn't intend to sign it. That announcement by me was immediately taken by the media and misrepresented. (impression) "The president was sittin' in the Oval Office, and he was in the process of a signing ceremony! All the people were there, and he's getting ready to go -- and then, somehow, he heard that I was saying, 'No way; don't do it,' and stopped." Why is it that my truthful characterization of this event does not get reported? Why...? None of these people who are reporting the untruth about this have ever called me or emailed me or anybody in my office seeking clarification. They're all just assuming that what they want to have happened is what did happen. That Trump's better instincts were about to prevail! That Trump was about to give them what they wanted. That Trump was about to cave to the Democrats, which is what they desperately wanted to report. But then I came along, and I got the message to the president to stop right in his tracks -- and he did. That is not what happened. It's not even close. And yet, despite explaining this I don't know how many times here as I've just done to you -- I've explained it countless times previous -- not one call from anybody asking, "Did you real stop this? Did you really convince the president...?" Not one call. They just continue reporting this, and it's actually mind-boggling to me. Let me tell you what wouldn't happen. Let's say that the way they say this happened indeed happened. So Trump's in the Oval Office or wherever and he's getting ready to sign this continuing resolution. There's no way anybody would run into the Oval Office and tell him, "Stop, stop, stop! Rush Limbaugh's saying don't do it." It would not happen. Trump would know before he was gonna sign it what I thought of it. But even if he didn't, there wouldn't be... I cannot imagine... Trump's not alone in the Oval Office during these signing things. Nobody's gonna run in there (whispering), "Mr. President! Mr. President!" whisper in his ear or say for the whole room to hear, "Don't do it! Don't do it! Rush Limbaugh says don't do it." That's what they want people to believe happened. He was in the process of signing. He was getting ready to sign this back in December, two weeks before Christmas. He was getting ready to do it. Democrats were salivating! They were on the verge. Trump was gonna sign the CR. The government's gonna stay open. The budget's gonna be filled with money and no wall. Trump was gonna totally cave on his signature issue, and they could taste it. They could feel it! They were chewing and they were ready to swallow it and go have a party. And then all of a sudden, I say on the radio, "I just got a note from somebody with the president assuring me the news is not true. He's not gonna sign it." That then becomes, "Trump was on the verge of signing it until I told him not to do it." There's no mechanism that I know of where somebody in the White House in the West Wing is listening to every moment of this program and then running in to the president and telling him what I say he shouldn't do on anything. KAY: In Trump's mind, the wall is so much bigger than just a wall, right? This is his presidency. It's his ability to negotiate, his ability to be tough, his ability to stand up to Democrats, his ability to give the base what they want, his ability to deliver on the promises that he made in the campaign. It's all of those things wrapped up into the symbolism of the wall. And the question at the moment seems to be: How low is he prepared to go and still feel that he can sell this to Rush Limbaugh and say, "You see, I’ve got more than rose bushes. I’ve got a wall." RUSH: (laughing) How low can he go and still sell it to me. Ah, folks, if I could only... (laughing) If I could only tell you a few things. This is so... This is so distant, so far away from the truth that it defies explanation. I would love to be able to give you the incontrovertible truth, but because I am discreet and respectful of privacy, I shall not. But you can trust me. First off (impression), "This is his presidency, his ability to negotiate, his ability to be tough, his ability to stand up to Democrats, his ability to give the base..."
What's missing in all of her reasoning about why Trump's doing this? What's missing is Trump's real motivation. Preserving, defending, protecting, saving America! Trump's not doing any of this to show his ability to negotiate. He's not doing any of this to show people he's tough, his ability to stand up to Democrats. Nobody's questioning that! What they still don't get: Donald Trump believes these things. It's why he got elected because his voters know he believes them, as they do. "Make America great" actually means something -- and it's wonderful. It is superb. We haven't had presidential leadership like this since the 1980s and rarely before that! Donald Trump is literally a man of the people. He's not from this insider group of elites who think they put together a world that includes America with a specific role America has in the world. That's not how Donald Trump views America. He views America as the standalone, greatest nation in the world, that when it's humming on all cylinders the world benefits like never before, as do Americans. That's Donald Trump's belief system, and a wall or some kind of border security is to make sure that illegal immigrants do not come in here and goof up everything and get away with breaking the law and distort and pervert our culture. It's no more complicated than that. But in her little world here, in her little political world (impression), "This is all about Trump trying to preserve his presidency, show that he can negotiate, show that he can be tough, show that he can stand up to Democrats, show that he will give his base what they want, show that he is able to deliver to promises." He's already demonstrated every one of those things! It's all of those things wrapped up into the symbolism of wall. No, the wall isn't symbolic. The wall is real. Border security is real. It's why Donald Trump got into this race. Now (impression), "How low is he prepared to go and still feel he can sell this to Rush Limbaugh?" My friends, do you realize if that were in any way a factor, I don't think I'd be doing what I'm doing here. I would be somewhere else. I would be in his administration. I'd be doing something that's actually involved in the implementation of policy. But see, these people grab hold of something that they believe or want to be true, and the lie digs deeper and deeper and deeper to the point that the lie becomes reality to them. Here's another one. Robert Costa. This is the same guest, and Costa has to reference me, the right wing and others and how intransigent we are. COSTA: But is the right-wing -- like Rush Limbaugh on radio and others in the blogs -- saying don't accept anything less than that $5.7 billion? KAY: P-please don't shut down! COSTA: -- Republicans on Capitol Hill? KAY: "Please don't shut down," and people on his reelect campaign also saying to me that they would much prefer that he accepted the deal, because they realize that the shutdown is killing them and tune out some of those more extreme voices on the right. RUSH: Well, I... (chuckles) Once again, I have abundant proof that this is total BS. Again, the polling data: Trump's at 52% after a government shutdown. It wasn't that long ago. He's at 52% after a government shutdown, after the Green New Deal, after what's been going on in Virginia, after what happened in New York, all related to abortion, after the Democrats demonstrating who they really are when it comes to racism. They are the real racists and they're demoing it, and they are the true sexual abusers, and they're demoing it. All of that has happened plus the shutdown and Trump is at a record high of 52%, and she still is talking from the playbook and from the owner's manual of Journalism 101. (impression) "Government shutdown hurts Republicans. Republicans don't want government shutdowns. Republicans hate it," and some Republicans still do because they're just thick and don't get it. Republicans are saying (impression), "Don't shut it down! Don't shut it down, please! Even on his reelect campaign, they would much prefer he accepted deal rather than listening to the extreme voices on the right." I, by the way, a little caveat here, I don't doubt that there are people in the Trump realm, because we know there are people in the Trump realm, that are leaking against him and trying to undermine him, and I have no doubt that there are people in there who wish Trump would listen to them as they seek to undermine him. But instead he chooses to listen to people who actually have his best interests at heart, as well as the country. CLIFT: The Republicans and the Democrats can come to an agreement. They did already once before, remember? And the president decided at the last minute not to sign it because Rush Limbaugh, you know, called him a wimp and said he caved. RUSH: I didn’t call him a wimp, and I didn't say he had caved. I sat here and expressed my bewilderment. That's all I did! I might have said, "Mr. President, don't do this." But the idea that -- I'm not gonna go through this. You see how this stuff gets a life of its own and doesn't go away. One more. C-SPAN Washington Journal. This is this morning. John McArdle is the host. 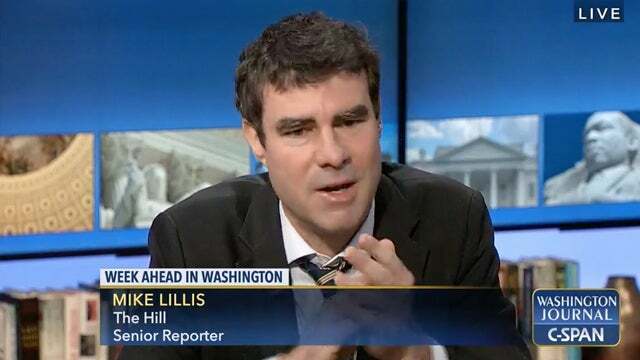 He's got somebody on from The Hill, Capitol Hill newspaper named Mike Lillis. And they're talking about the government shutdown negotiations. 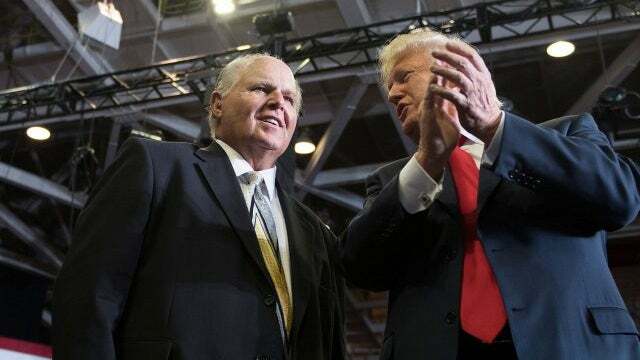 LILLIS: They seem to be playing a lesser role for sure, the senate of course had passed a short-term spending bill that the president had signaled he would support, and then he really got clobbered that day on Rush Limbaugh. When Donald Trump voted to open up the government, some of the others who were critical beforehand supported it, they kinda defended that move, the Republicans were taking a big hit and the conservative media I think recognized that at the time. RUSH: Right. But we're playing a much lesser role this time around. For some reason, folks, Trump is not listening to me this time around. I wonder why. Why isn't Trump listening? He clearly listened to me back in December. But these people think, nah. You know why? Because I haven't said anything here to give them some idea that they can misreport and expand and do it being something they want. I easily could. I could sit here and say I just heard from so and on and the president's once again assuring me this is -- I could read a tweet or whatever. Well, that's what I can't say, see? I could put all this to bed. I could put all this to bed with one story. But I can't put all this to bed with one story.